London's second two Cycle Superhighways opened yesterday. One (CS8) goes from Wandsworth to Westminster, while the other (CS2) goes past my front door. So you can probably guess which one I intend to drone on about for a few days. Millions of pounds have been spent rejigging junctions and laying down lane markings in an attempt to make two-wheeled East End traffic safer. 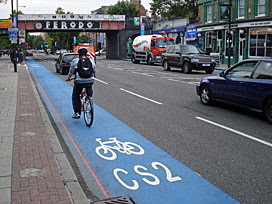 But will CS2 encourage me to buy a bike, entice me onto the road and enrol me in the cycling revolution? Not a chance. Because this may be a Cycle Highway, but it most definitely isn't Super. The problem's worst in the rush hour when the two lanes of traffic are full. Either there are cyclists getting in the way of lorries and buses, or cyclists are unable to make good progress because there's too much blocking traffic in the way. But at other times, when traffic's light, something mysterious often happens. Car drivers notice there's a bright blue strip down the left-hand lane, decide it must be something to avoid and keep their distance. They all filter into the right-hand lane instead, leaving the left-hand lane clear for cyclists to ride in relative safety. One whole lane for bikes, one whole lane for other road users - it's not the way CS2 was intended to work, but sometimes it just does. But would you catch me riding along a lane-share like this? Not a chance, because even at quiet times there's nothing to stop something massive sharing my bike lane so closely that I end up underneath it. Alas, for a disturbing part of its length, CS2 is officially the left-hand half of a normal lane of traffic. It seems that Bow Road's original separate bike lanes were deemed unsafe because they were too narrow, so they've been absorbed into wider lanes that turn out to be even more dangerous. Verdict? Fail. When traffic's busy, cyclists can't get to this one. 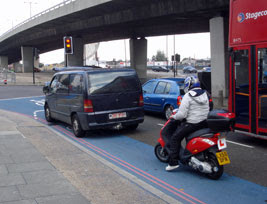 They whizz down the blue-painted stripe as far as the Bow Flyover bus stop, separate and safe, But then traffic narrows to two lanes outside McDonalds, at which point the Cycle Superhighway swings in to become the left-hand half of the left-hand lane of traffic. The lights are usually red so a queue of vehicles builds up, and there's usually a bus or a van or a lorry or something paused and waiting. And if there is, sorry cyclist, you're not getting past, not unless you're naughty and bike up onto the pavement and then back down again. Large amounts of money have been spent making the roundabout itself cycle-friendly, what with special ramps and segregated blue cycle lanes and all, but this Advanced Stop Line is an inaccessible white elephant. Whoever wrote the Cycle Superhighway rulebook, they clearly weren't thinking ahead. Verdict? Fail.